We thank the Divine Mother Sri Rajarajeswari. 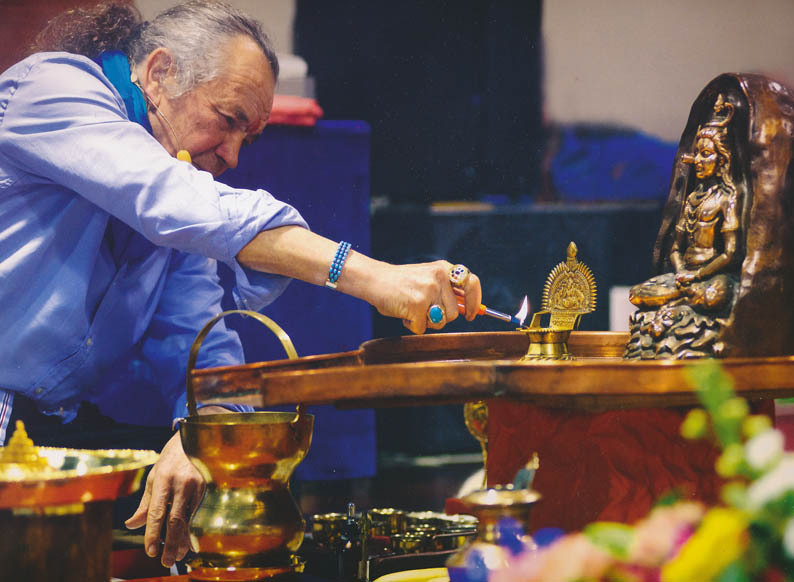 The puja, a ritual of worship and offerings, promotes awareness of a direct and personal contact between you and the Divine Mother or Divine Source. Be grateful to the Mother. Be grateful to the Guru. He is the human form of the Divine Mother (Marioji). Some of the most important events among Yogarmonia ’s activities are the evenings dedicated to “ the Prayer of the Heart”. Jesus said “I am there where two or more pray together”. During these special evenings of prayer thanks to the Master’s Grace it is possible to create, feel and share a special state of Inner Harmony between the participants and the whole Universe. People seat and pray and meditate in circles creating an human living Yantra thus creating a very strong Energy. This Energy is aimed to establish Peace in all the world by elevating of human Conscience; to heal body-mind-spirit of people that are present and also of those far away for the benefit of which someone of the presents prays. Every kind of illness, even serious ones, can be positively affected by these prayers. “Hay” – “hail to You, The Living in my Hearth! Give Life to my existence! Quench my (spiritual) thirst with the nectar of Your Love! Oh Lord, revitalize my spirit, brighten my Conscience trough your Divine Conscience and, please, fill my heart of Divine Wisdom and Consciousness. This is what is asked for during “the Prayer of the Heart”.